We love America’s national parks, so it’s not surprising that we managed to visit three in one day on a West Coast road trip. After visiting Yosemite National Park in California, which we believe is one of the most beautiful places in the world, we headed towards Crater Lake National Park in Oregon. Along the way, we stopped for a couple of hours at Lassen Volcanic NationalPark in northeastern California. A lesser-known destination, this park clearly shows how the earth’s surface is constantly evolving. It provides an area for geologic study of ever-changing thermal areas as well as showcasing long-ago volcanic activity and subsequent recovery of nature. First-time visitors will want to take the 30-mile diving tour on the main park road as we did. Along the way we stopped to view hydrothermal features like fumaroles, boiling mud pots, steaming sulfur springs, and three of the four types of volcanoes in the world. At Sulphur Works we watched superheated ground water bubbling to the surface. Boardwalks lead to many of the ecological sites, and it’s best to stay on the trail since these molten regions have been known to collapse. Clear, sparkling water of shallow Emerald Lake, a glacial U-shaped pool at the base of a mountain, gets its green color from algae growing at the bottom. It makes a wonderful photo opp. 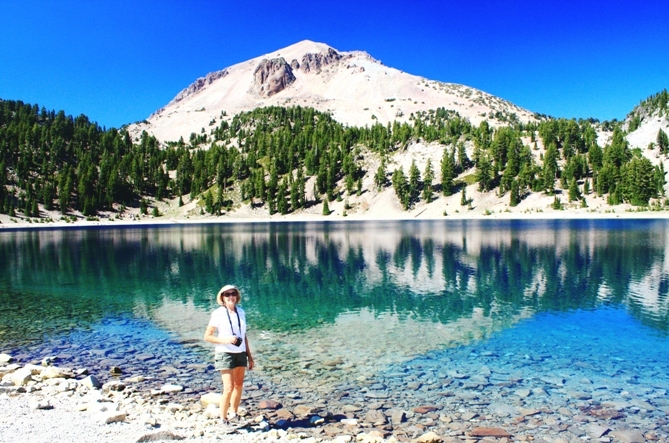 Emerald Lake sparkles in Lassen Volcanic National Park. A little further down the road, we stopped to admire the gorgeous azure water of Lake Helen. A true alpine lake, it is 110 feet deep and frozen most of the year. During our July visit the ice had melted, but given the cold temperature of the water, we enjoyed colorful mountain reflections and resisted the temptation to wade in. And there was still snow on the ground in places—an ironic sight for shorts-clad visitors like us. Hiking trails scattered throughout the park attract visitors who come to learn about, explore, and appreciate the unusual landscape. Some trails lead to hidden lakes, but lakes like Emerald and Helen are easily accessible from the road. Since our time there was limited, we stuck to sights near the main park road. 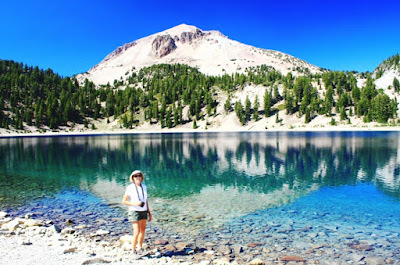 Lassen Peak, at more than 10,000 feet tall, provides a beautiful backdrop for a landscape created by volcanic activity. Seeing what remains today, you can muse about Lassen’s eruption in 1915 which blew a mushroom cloud of ash seven miles into the sky. This park may not “wow” you with gorgeous scenery found in other national parks, but it’s worth visiting to observe the interesting geology and geography that is being preserved. And take a hike if you have time. Meadows filled with wildflowers are lovely in spring and summer.